At VetMeasure, we are crazy about canines. Our staff thinks about canine health all day every day, and then we go home and cuddle with our favorite pups. Our Operations Manager, Mallory, has a two-year-old, half-boxer-half-various herding dog mixes, named Remy. Remy is very playful, yet reserved with strangers until she gets to know them better. Remy “requires” twice daily trips to the dog park and many belly rubs. Mallory and Remy love to hike and backpack together. 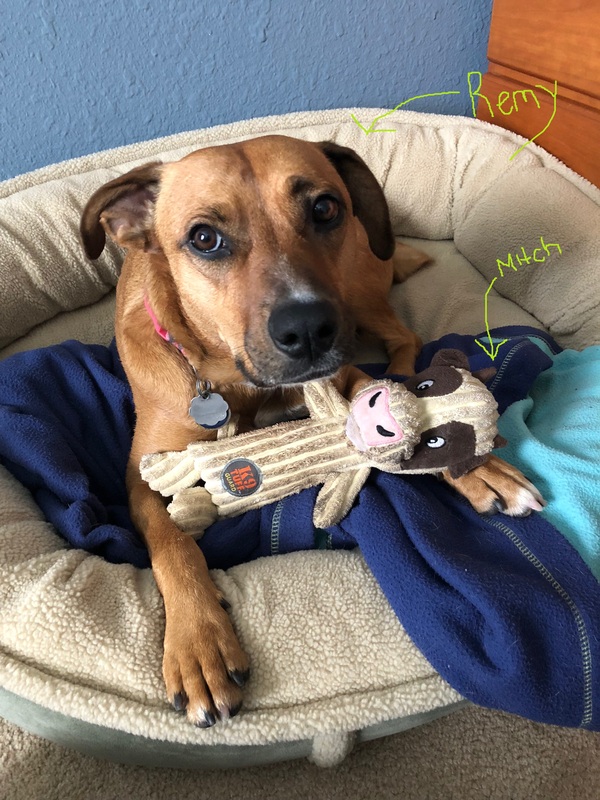 You can find Remy eating her favorite snack, peanut butter, and with her favorite stuffed cow, Mitch, by her side! VetMeasure has two faithful interns, Katelyn and Allyson. Katelyn has a four-year-old German Shepherd named Jack that lives at home with her parents. Katelyn describes him as ornery, but protective as he will never leave your side. Apparently, Jack is also very curious, as he frequently opens the family’s packages, not addressed to him (how rude). Katelyn’s family has owned several dogs before Jack, but Jack’s their first German Shepherd. Jack’s favorite item is his blankie that he sleeps with every night. Allyson has two dogs famous for their strange names, Baby Butter and Pepe Le Pew. Both pups are rescue dogs and named after cartoons. Allyson explains that Baby Butter, who is about 14 years old, got her name because she reminded her family of the character Baby Butter from the PB&J Otter cartoon. While, Pepe Le Pew, seven years old, looks just like the skunk from Looney Toons and is just as lovey-dovey. Baby and Pepe are best friends, and their favorite activity is to explore the backyard for critters to chase! VetMeasure wants to know more about your pups! Tweet us @vetmeasure or find us on Facebook to share more information about your furry family members!